Every time the laws were changed and passed a new round of submissions for Civil War pensions would follow. In 1916, Amarilla tried again to obtain George Barclay’s Civil War Pension. This meant that she had to fill out the Declaration for Widow’s Pension form to get things started. The Barclay Hotel burned down in 1915 and it appears she had to seek out another set of marriage, divorce and other papers if she could not find them in her home or hotel and resubmit. I find that interesting because the government had a 2 inch file on George’s Pension which I obtained from the VA not the National Archives. Of course the Veteran’s Administration really didn’t start till 1921. The National Civil War Museum Entrance in Harrisburg, Pennsylvania. This Widow’s form was filed on 24 October, 1916 and submitted. As far as I can tell the process took till July of 1919 to finally come to an end. The application was being considered for pension a total of three years in process. Here is a summary of what happened. In these documents her name is spelled Ammarilla and the last name is Barcklay. October 24, 1916: Declaration for Widow’s Pension signed and forwarded. March 2, 1917: Overview card for Remarried Widow of George. A. Barclay with summary of the file. April 3, 1917: Letter from War Division to D. Elliott Waggeman, Atty, Wash D.C. They want testimony from two credible witnesses who knew the soldier from the time he attained marriageable age, showing whether he had been previously married with further instructions in order to comply etc… Signed by the Commissioner. April 13, 1917: Letter from the Auditor for the War Department to Treasury Department, Wash D.C.
An application was filed December 17, 1867, in the Paymaster General’s Office, War Department, for bounty under Act of July 28, 1866, by George Barclay, late of Co. I, 9th Minn. Inf. and said application is herewith transmitted with the request that the same be returned to this office at the earliest practicable date. Signed by a J.L. Baity Auditor. (No copy of this bounty claim was in the pension file). That her husband’s full and correct name was George Angus Barclay and he was born in Connecticut. His age at enlistment as nearly as she can compute was between 16 & 18 (he was 18), and his occupation when he enlisted was farmer, and when he enlisted he lived at Shakopee. She further states that his height was 5 feet 6 inches, his complexion dark, color of eyes dark brown, hair dark, and as to marks and scars she states he had none that she knows of. She further states that her own maiden name was Spracklin and that after the soldier George Angus Barclay died she was remarried to Jefferson G. Dawes from whom she was divorced in the year 1910 on her own application. She further states as to any former marriages of the solider George Angus Barclay that he was never married until he married the affiant and that she states that she was never married before she married George Angus Barclay. Signed Ammarilla Dawes, and F……Shiller, 25 August 1917. Notary Public seal. September 10, 1917: General Affidavit. That her various places and dates of residence since the death of the soldier, Geo. Barclay, have been Pine River, Cass Co., Minnesota. Cover form from Department of the Interior, Bureau of Pensions card with summary of contents. This is like their cover piece. John Leef, age 55 residing in Pine River, Cass Co. and Mrs. J. P. Leef aged 50 years. That they have been personally acquainted with the claimant, Ammarilla Dawes since of the date of the death of the solider, George Barclay and that she has not been married since that time other than to Mr. Dawes who divorced. November 27, 1917: A note asking for more information about the marriage to Dawes. January 17, 1918: State of Minnesota, District Court, Co. of Hennepin – the Marriage License of Jefferson and Ammarilla Barclay 2 September 1902 was submitted to the Commissioner. February 5, 1918: Additional Evidence General Affidavit. That her husband, Jefferson G. Dawes, did not render any military or naval service to the United States in any capacity. July 9, 1918: This was a note/letter talking about rules about pensions and the marriage of Jefferson G. Dawes and the name and service of George Barclay etc. July 22, 1918: Returning of documents by Auditor of the War Department, and their divorce papers are submitted by Cass Courthouse County, Minnesota. March 3, 1919: Miscellaneous papers contained in the pension file. April 22, 1919 and on April 25, 1919 a formal letter to the Postmaster…. a H.M. Vandervort requesting more information about the situation – ret’d to Chief _______to call on Postmaster at Pine River, Minn. and determine whether she has remarried and what her standing and reputation in the community since February 1, 1910. The report back is not good something about her living with a man by the name of George Urton and it is not known if they are married. Her reputation is mixed. May 18, 1919: A letter was sent to the Chief and Special Examination Division requesting a special investigation to 1) to determine whether she has remarried more than once and after her divorce from Dawes which would jeopardize the pension. 2) They then wanted to know her involvement in George’s death. 3) a Mr. Young was assigned the task of investigating Amarilla Barclay Dawes. June 7, 1919: A letter telling the Postmaster that they want to personally interview Amarilla and J.G. Dawes, Mr. and Mrs. Leef, please supply information about where they were living, Signed by E. W. Young, Special Examiner. June 20th, 1919: Letter to Mr. E.W. Young signed by A.K. McPherson, Clerk of the Court, Walker, Minn. He states he finds no evidence in the proceedings of the Coroners inquest that show that any suspicion was lodged against the Widow of the deceased G. A. Barclay. He took the deposition in Brainerd from J.G. Dawes. While husband of the claimant he was also mayor of Pine River and that he was regarded as something of a four-flusher which was reference to his business transactions and he says he observed this behavior in J.G. The special examiner believed J.G.’s testimony about Amarilla. He then went to Pine River and didn’t tell Amarilla about his interview with J.G. prior to visiting her. She is now engaged to George Urton who lives with her. Then the special examiners remembers George that this soldier was a storekeeper, saloonist, postmaster, logger and big in the area, also a hotel keeper and his death and the gossip. The case appears for final action. Deposition of J.G. Dawes, June 18, 1919 in Brainerd, Minn. This is a summary not a full transcription. My age is 70 years last March, my residence and address are Brainerd, MN in real estate business. I got married to Rilla Barcklay in Minneapolis date do not remember, but some 15 or 16 years ago. I did not know her husband in his lifetime. Became acquainted with her at Pine River when I was there on a matter of business. She was in the logging and store business there and wanted me to manage it for her, offering me half. I took it and turned over to her probably as much as $10,000. He then makes comments about Grace and Ronald which are not good…She and I always lived together after our marriage, until the separation in Pine River, where I built her home she now has….I did not get a divorce from her. She got it from me. I let her get it. He comments about the divorce are not good. Then Mr. Young asked about her reputation and her conduct during the marriage. J.G. proceeds to give details about her behavior which are not good…He states he has no interest in her pension claim and nothing against it. Deposition of Amarilla Dawes, June 19, 1919 in Pine River, MN. This is a summary and not a full transcription. My residence and address are Pine River, Cass Co., Minn, am keeping house, I am claiming pension as the widow of George. A. Barcklay who was a Civil War Soldier. He was not a pensioner. My only claim to pension has been made on account of him. He was in the I, 9 Minn. Inf. I married Jefferson G. Dawes after Barcklay’s death, date do not remember. Married him at Minneapolis and got divorced from him going to Bemidji to meet the judge, I guess the papers are in Walker….She talks about George Urton and that she is engaged to be married. Mr. Young proceeds to ask her questions about her conduct and she replies refuting J.G.’s comments. I was never accused of having anything to do with Mr. Barcklay’s death, except by Mr. Dawes. She mentions Louis Bebeau being arrested, tried and acquitted of the murder of her husband. I would rather forgo any pension I might possibility get than to have this read in the presence of witnesses or to have any further inquiry made about it. July 8, 1919: Wid. Org. Ammarilla former widow of Geo. A. Barclay…Pension is rejected warranted on the facts show in this claim? 1) Adulterous cohabitation while claimant was the wife of J.C. Dawes is no bar to pension. 2) There is nothing to show adulterous cohabitation after claimant’s divorce from Dawes until Sept/Oct 1918. July 10, 1919: Another statement, our further consideration of the case and in view of claimant’s statement before the special examiner that she would rather foregoing any pension she might possibly get than to have her deposition read in the presence of witnesses or to have any further inquiry made about it. The claim may be rejected as if now stands on the ground of abandonment of further prosecution of same as declared in her deposition taken by special examiner on June 191, 1919. Signed A.A. Aspenwall, Chief, Board of Review. On July 22, 1919: C.M. Saltzgaber, Commissioner writes to W. Elliott Waggaman, Atty, Wash D.C. and to Amarilla that the claim is rejected on the ground of the claim’s abandonment of further prosecution of claim etc. Well, isn’t this a fine pickle. I really am proud of my great-grandmother for abandoning the pension claim. I think both her and J.G. did not have any understanding of what was happening and it appears they were not informed by Mr. Young that he was going to approach them both. It was unfortunate but not uncommon that this type of investigation occurred. The Commissioner of Pensions refused to issue a certificate to allow pension under the special act on the ground the evidence shows that since the passage of the act of August 7, 1882, and prior to an since the approval of the special act, the claimant has been guilty of open and notorious adulterous cohabitation. Appeal was entered August 14, 1919. One of the general provisions of the pension laws is as follows: the open and notorious adulterous cohabitation of a widow who is a pensioner shall operate to terminate her pension from the commencement of such cohabitation. Act of August 7, 1882, sec. 2, 22 Stat., 345. Source: Decisions of the Department of the Interior in Appealed Pension and Bounty Claims, Editors John W. Bixler and Ralph W. Kirkham, Google Books. page 441. Amarilla would try one more time in 1939 for George’s pension and get a little help from her grandson Gordon. If you are wondering what the term “four-flusher” used to describe J.G. means it is a reference to the game of poker and how someone presents a certain face to others. I have posted about J.G. Dawes on this blog and you can review his posts and Amarilla’s just go to the Page at the top of this blog that covers George and Amarilla’s table of contents of posts written. About the time of George A. Barclay’s murder in 1898, J.G. Dawes entered into Amarilla’s life. He became her second husband. He join her in business activities. He became mayor of the town of Pine River and helped to plat the town. J.G. Dawes also built her a house in Pine River. About 1905 he started building a hotel in Longville and expanding his business interests. After 1905, J.G. Dawes and Amarilla started to go their separate ways. I do not know exactly when J.G. made the break and left Pine River for good. The first is a Serving of the Complaint to Jefferson G. Dawes by the Sheriff of Hennepin Co., Minnesota, Otto S. Langum on 10 December 1909. The next is a two page document called a Complaint between the two parties, stating that Ammarilla is 51 years old and J.G. is 57 years old. That they were married on the 2nd day of September in 1902 in the city of Minneapolis, MN. That the plaintiff, Ammarilla, has been living in the state of Minnesota for more than one year. That the plaintiff was treated in a cruel and inhuman manner….. There are no children issued from this marriage. 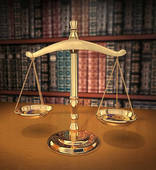 That the plaintiff has real and personal property valued at $7000. That the plaintiff demands Judgment to dissolve the marriage between the two parties. On the second page of the document, Ammarilla is sworn to truth and the document is notarized on the 8th day of December 1909. Below is a summons to J.G. Dawes to answer the complaint and if he does not do so in 30 days, judgment will be rendered. The third and final document is the Divorce Decree itself. Apparently J.G. Dawes did not appear or contest the divorce and it was granted to Ammarilla on 1 February, 1910 in Cass County, Minnesota. I don’t know why this makes me sad. I like J.G. Dawes even though he may have been a big talker and told a good tale. He was still a very interesting person and I wish I knew more about him and where he came from so I could judge his character. Some articles that appeared in the newspaper about him, that I have posted in past posts on this blog, suggest he was a little arrogant. The story of what happened to Jefferson G. Dawes is not yet over and he will appear in future posts. His time with Amarilla had ended and they both moved on. Amarilla would be on her own for nine years before she decided to remarry for the third time. George Angus Barclay was shot and killed on October 29, 1898 and the trial regarding the murder did not happen until a year and half later, taking place on May 7 and going through till the 16th of 1900! There aren’t any documents between the release of Andy Hayford in December 1899 until the 4th of May 1900 when Bebo requests that he be granted counsel for the charge of Murder in the 1st degree. He had no money and had been incarcerated for quite some time. A. H. Hall was assigned his defense attorney by the court. Hall filed a three page brief in it where he complains that the Sheriff created 2 jury panels and interviewed people. The clerk was supposed to create the juries. He said that the handwriting was not the clerk’s. He went on to say that the Sheriff would erase a name if he didn’t like what the potential juror said. Hall stated that at the beginning of the year a jury pool is created and there are plenty of people, therefore the Sheriff didn’t need to get a jury together. As far as I can tell there are no documents or maybe one or two that survived from the trial. There is a Director Examination of J. Deperrold and a testimony of Ed Mahon but I cannot be sure they are from the trial. It does read on Mahon’s papers called as witness on the part of the State, being duly sworn…no dates are on these documents. These documents are done in a question and answer style which makes me think they are part of the trial. There is a handwritten document about various testimonies which is extremely hard to read but it may be another of Hall’s writings. There is a platte map of Pine River that was used probably in the inquest, grand jury proceedings and trial. It has historical significance for Pine River because it shows where the buildings were. It was used to show how long it would take to get from one building to another. I think that the newspaper pretty much sums up the trial and what happened. Can you imagine sitting in the courtroom and watching this event unfold. The Cass County Paper, Front Page, Vol. 7, No. 18. “When the trial of Louis Bebo for the murder of Geo. A. Barclay was called on Monday the 7th day of May speculation as to the outcome ran high. To accommodate the crowd, the court was held in the Opera House and that was crowded in spite of the intense heat. The case was opened by the State’s Attorney Hon. B.F. Hartshorn abely assisted by Hon. C.C. McCarthy, of Grand Rapids, while the defense was conducted by G. W. Hall, of Minneapolis. The evidence adduced against the accused was very pointed and abely presented but was met in a masterly manner by overwhelming evidence. The jury was drawn with great care, over 150 men being called before twelve men could be found suitable to act. The case went to the jury on Tuesday, the 15th day of May at five o’clock p.m. and the jury remained out all night and until 11:30 a.m. of the following day when they bought in a verdict of not guilty. There is a pathetic side to this case that is very touching and sounds like a dime novel yarn. When Geo. A. Barclay was shot down by some dastardly coward a year ago last fall Bebo was suspected of the crime and close watch was placed on him which resulted later in his arrest and a hearing before Justice Sundberg where he as acquitted for lack of evidence. Later on more evidence was found that seemed to prove his guilt and he was indicted by the grand jury a year ago. Since that time he has been in close confinement in the county jail of Hennepin county and during this time two of his children have died and he was kept in total ignorance of the fact until he was brought here and placed on trial for his life. A brother of Bebo was here to attend the trial and had manfully supported the prisoner broke down and wept like a child when the words “Not Guilty” fell from the lips of the judge. You can see Mr. Hartshorn’s tombstone and a brief biography of him at Find A Grave. He is buried in the Motley Public Cemetery in Todd County, Minnesota. St. Paul. May 16, a special from Walker, Minn. says; The Trial of Louise Bebo for the murder of George A. Barclay at Pine River on Oct. 29, 1898, is ended after occupying the time of the court for over eight days. The jury was out all night and until 11:25 this morning, when they returned a verdict of not guilty, and Bebo was given his liberty. Bebo was arrested about 18 months ago on the same charge and discharged at the preliminary hearing before Justice E. R, Sundberg in this village for lack of evidence. The matter was taken up again by the grand jury a year ago and an indictment brought in against him. Since that time he has been in jail. During his confinement two of his children have died and his homestead at Pine River has been taken possession of by another party. Bebo is generally believed to be innocent and will return to Pine River and endeavor to regain possession of his homestead. Friday, May 18, 1900, The Brainerd Dispatch. This was almost the same article from the Duluth newspaper with a little more detail in this account. The news was featured in several other papers Cass Co. 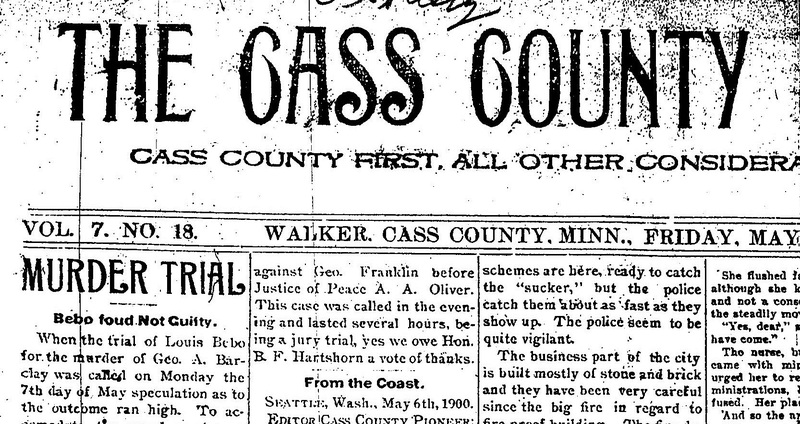 Independent Cass Lake Times May 17, 1900 and the Thursday, May 17, 1900, Duluth News-Tribune (Duluth, MN) pg. 2 issue. I wonder what my grandmother Grace thought about all this? She may have been grieving not only for the loss of her father George A. Barclay but for the loss of her first-born child who did not survive. This would have been George’s grandchild. It was born and died on the 29th of August 1899 and is buried in an unmarked grave at the Evergreen Cemetery with its grandfather George and its baby uncle George A. Barclay. There would be more children to come. What happened to Bebo, well life didn’t treat him to well according to an article in the Cass County Pioneer, Feb. 28, 1902, he was judged insane by the Probate Court at Walker and taken to the asylum in Fergus Falls and later transferred to Hastings Hospital were he spent the rest of his life till 1945 and was buried in Osseo, Minnesota. The trial was over, the verdict was brought in and Pine River moved into the new century and as they say life went on.